This week I had the opportunity to get up to Fort Collins, CO and pay a visit to the Odell Brewing Company. Typically when I visit Denver I bring back some Odell beers, especially the 90 Shilling Scottish Ale. However, now that the airlines are gouging customers by charging for checked luggage, I don't bring my extra beer suitcase on this trip. There are several breweries in very close to one another in Fort Collins, including Fort Collins Brewing and New Belgium Brewing, however time constraints allowed me to visit just one. But first a stop for lunch and to meet, in person, a fellow beer blogger. "Chipper Dave" blogs about Colorado beers over at Fermentedly Challenged, and also at the Northern Colorado Beer Examiner. Fort Collins is a sandwich shop haven, and Dave chose Choice City Deli for our lunch meeting spot. Besides the great sandwiches, the deli has an extensive beer menu, unlike any I've seen in a deli back home. Here's a hint, ask the proprietor about beers not listed on the menu. He's a craft beer fan and keeps a eye out for the unusual. I selected a 90 Shilling Ale to pair with my sandwich. After lunch, Dave joined me in visiting the Odell Brewing. I managed to drive right by the brewery. I was looking at a driving range on the right side of the road when I sensed the familiar brewery aroma. The brewery is on the opposite side of the road and I smelled it before I saw it. There was some time to kill before the brewery tour began so I opted to enjoy an Odell Imperial Stout while we waited. This seasonal is part of the brewer's single batch series and is generally available January - April, so what was being served at the brewery was the last of this year's batch. The Imperial Stout pours very dark with a moderate brown head that leaves plenty of lacing on the sides of the glass as the beer is consumed. The aroma is on the mild side, mostly roasted coffee. The beer goes down very smoothly with coffee and dark chocolate being the predominate flavors. I also noted hints of vanilla and some dark fruit. A hop bitterness rounds out the finish. Although it checks in at 8.0% ABV, the alcohol is well masked. Mouthfeel is smooth and slightly thinner than one might expect. It was an enjoyable drink to carry along on the tour. Our guide was very knowledgeable on the history of the brewery, the brewing process, and the beers themselves. 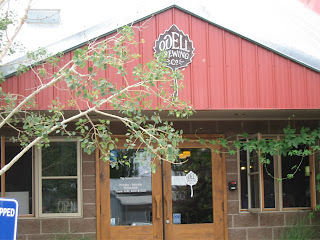 Odell is Colorado's second craft brewery, after Boulder Brewing. The brewery has had a steady history of expansion and they are preparing to make another leap. The next expansion phase will grow production from 40,000 to 100,000 barrels a year. Currently the state of Missouri is the furthest east that Odell beers are distributed. Perhaps with the increased production capacity one could hope the distribution region might expand. However as Odell's reputation for making quality beer grows, increased production is needed just to meet the demand in their current distribution region. During the tour we saw the oak barrels that house the new oak aged beers the brewery plans to release in another month or so. Our guide informed us that nearly all of this beer has already been committed to pre-order sales. Those of you living in the area would do well to keep a watchful eye out at your favorite beer stores, as there will be very little available even at the brewery itself. The tour was fun, and the beer good. It was an enjoyable afternoon and chance to meet a fellow blogger and new friend. I've uploaded a few pictures from the brewery tour. Update: Dave has posted his review of Choice City Deli.